(FranchisePick.Com) Is YTB International, YourTravelBiz.Com a Scam? California Attorney General Jerry Brown says it is. He claims the whole thing’s a scam that recruits thousands of members with deceptive claims. According to Brown, the only people getting rich are a handful at the very top, while most get nothing. The California Attorney General is suing Wood River, IL based YTB International, board chairman and founder Lloyd Tomer, his son and current chief executive Scott Tomer, the company’s third co-founder J. Kim Sorenson and Andy Cauthen, president and CEO of YTB subsidiary YourTravelBiz.com. The suit is seeking $25 million in fines and restitution. AG Jerry Brown wants to shut down the operation, which employs 300. The suit accuses YourTravelBiz.com, a subsidiary of YTB International, of recruiting tens of thousands of members with misleading promises that they’d earn large sums of money selling travel online to friends and acquaintances. Agents pay YTB a $499 fee to join, then $50 a month thereafter. They also often buy training materials…. The company… has grown fast in recent years, nearly tripling its revenue in 2007 to $141 million, with profits of $3.2 million. At the end of March, it claimed nearly 139,000 “registered travel agents” and an even larger number of sales reps who sell the agencies and earn a commission on their business. 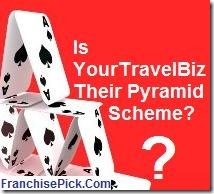 RELATED: YTB INTERNATIONAL: Is YourTravelBiz.Com a Pyramid Scheme? ARE YOU FAMILIAR WITH YTB INTERNATIONAL & YOURTRAVELBIZ.COM? IS IT A PYRAMID SCHEME? Share a comment below.